Four Indigenous women are fulfilling their study ambitions at CDU’s Alice Springs campus, thanks to an innovative program recognising their past achievements and experience. The Indigenous Alternative Entry Program (IAEP) has operated at the Alice Springs campus since June, allowing students to complete the program without having to travel north to Darwin’s Casuarina campus. 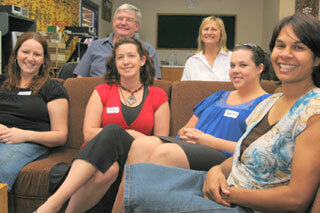 The four women are the latest group accepted to study at CDU. Three of the four students were offered higher education placements with the other enrolling in the Tertiary Entrance Program (TEP) before pursuing an undergraduate degree. All four women are working in roles that involve helping others and were motivated to enhance their skills through higher education. Bachelor of Social Work applicant Cassandra Dodds said the course would give her relevant skills to further assist clients at the Alice Springs women’s shelter where she worked. ”I really enjoy helping Aboriginal people to help them see the resources that are out there and this course can give me further skills to do this,” she said. Kelly Leonard has worked as a teacher’s aid in Alice Springs and was motivated to begin a Bachelor of Teaching and Learning at CDU which, she said, was the next logical step in her career. ”With my experience in the classroom I could see myself teaching in the near future and the Alternative Entry Program was an ideal entry point,“ she said. Brooke Wheeler decided to switch from a career in healthcare administration to a practical nursing role after being inspired by the health professionals around her. “I was really inspired by their commitment to the welfare of others and saw the job satisfaction first hand so I applied to study a Bachelor of Nursing,“ she said. Tammy Bales took the opportunity to apply to study a Bachelor Laws after moving to Alice Springs for work. She said her previous experience in a law firm and current role at Centrelink helped her to realise an interest representing disadvantaged clients in the legal system. ”I’ve always had a passion for family law after childhood experiences and took the advantage of CDU’s entry program to make it a reality,“ she said. Support lecturer David Reilly said all four students demonstrated maturity and commitment to their study at a degree level. ”They have confidence in their future career direction and see the opportunity to build upon an already successful career through higher education,” he said. His colleague, Lorraine St Clair, said she was impressed with the attitude of the students. ”They have all made a significant commitment to study over the next few years and I look forward to helping them achieve their personal and career goals,“ she said.